"Where once you had the freedom to object, to think and speak as you saw fit, you now have censors and systems of surveillance, coercing your conformity and soliciting your submission. How did this happen? Who's to blame? Well certainly there are those who are more responsible than others, and they will be held accountable. But again, truth be told...if you're looking for the guilty, you need only look into a mirror. I know why you did it. I know you were afraid. Who wouldn't be? War. Terror. Disease. There were a myriad of problems which conspired to corrupt your reason and rob you of your common sense. Fear got the best of you and, in your panic, you turned to the now High Chancellor Adam Sutler. He promised you order. He promised you peace. And all he demanded in return was your silent, obedient consent." Events are unfolding right now in the United States that make V for Vendetta prophetic for the United States. Not that we needed this movie to see what might be happening... basic world history demonstrates the fact that formerly prosperous countries become sickly and poor when the citizens of that country lose track of the values that made their country prosperous in the first place. Americans have found success by sticking to a few, basic principles (which we are slowly drifting away from), such as ingenuity, hard work, individual responsibility, personal freedom and a healthy respect for the Almighty. In the past few years we have come under a few major threats, from terrorism to financial failure, which have inspired us to surrender to fear and shift toward a more socialistic mentality. We have become too lazy or too afraid to take responsibility for ourselves; we would rather a big government take responsibility for us. We are in the process of giving up our personal and financial freedom in exchange for a sense of protection from financial woes, international threats, health problems and other issues (such as hurricanes and earthquakes) that are out of our control whether we want to admit it or not. Will the United States of America become "The United Socialist States of America?" If Americans make this happen, yes. Change can be good, but we should be wary of giving in to complacency or anything that compromises our conscience. One thing is already leading to another. We are compromising the long term to feel secure for a little while right now. 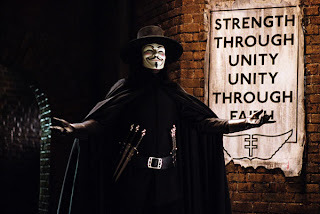 It's not too far fetched to imagine an America that resembles the England of V for Vendetta if we, inspired by fear, continue to shirk our individual responsibilies in favor of government protection. The more we entrust our well-being to a few government officials, the more we open ourselves up the abuses of power that men have a hard time resisting when they're presented with such opportunities. It's pretty obvious that V for Vendetta was a direct response to George Bush's War on Terror. Although I thought the movie was far too preachy in that respect, I do agree that a similar crisis definitely could happen in America. Luckily we've got the 2008 Election coming up! V for Vendetta gives us hope. In the form of one man or a whole population united to fight what is really wrong. The human race hasn't reached it's peak due the antics of a minority. Hope that changes. At least I'm doing my part informing people and creating awareness. Awesome Post, and I think that Bush isn't the best president we've ever had. Wow, a fresh voice. Glad I found your blog. Why do people immediately associate questioning the government with being unpatriotic? It's one of the basic principles our great nation was founded. Speak up and speak loudly! Many people have died so we have that priveledge. Thanks for the post. I think the movie delve into some issues that many of us don't like to think about. It, like the matrix, explores the FACT that all civilizations must end. Eventually someone is born that will bring it to an end. 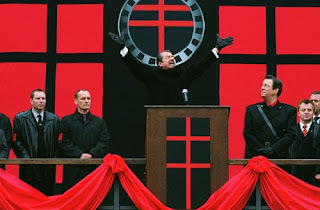 so, will obama or mccain bring us to the v for vendetta future? I guess we have had our V in the last election!